Casu marzu (Sardinian pronunciation: [ˈkazu ˈmard͡zu], also called casu modde, casu cundídu and casu fràzigu in Sardinian language, or in Italian formaggio marcio), literally translating into English as "rotten/putrid cheese", is a traditional Sardinian sheep milk cheese, notable for containing live insect larvae (maggots). Although found in the island of Sardinia, a variety of this cheese is also found in the nearby Corsica, where it goes by the name of casgiu merzu. Derived from Pecorino, casu marzu goes above and beyond typical fermentation to a stage of decomposition, brought about by the digestive action of the larvae of the cheese fly Piophila casei. These larvae are deliberately introduced to the cheese, promoting an advanced level of fermentation and breaking down of the cheese's fats. The texture of the cheese becomes very soft, with some liquid (called lagrima, Sardinian for "tears") seeping out. The larvae themselves appear as translucent white worms, about 8 mm (0.3 in) long. When disturbed, the larvae can launch themselves for distances up to 15 cm (6 in). Some people clear the larvae from the cheese before consuming while others do not. The cheese, along with one of its Sardinian makers, Giovanni Gabbas, received attention on the US TV program Bizarre Foods with Andrew Zimmern. Zimmern described the taste of the cheese as "so ammoniated" that "it scorches your tongue a bit." The cheese is known to leave an aftertaste for a duration of up to several hours. Casu marzu is created by leaving whole Pecorino cheeses outside with part of the rind removed to allow the eggs of the cheese fly Piophila casei to be laid in the cheese. A female P. casei can lay more than five hundred eggs at one time. The eggs hatch and the larvae begin to eat through the cheese. The acid from the maggots' digestive system breaks down the cheese's fats, making the texture of the cheese very soft; by the time it is ready for consumption, a typical casu marzu will contain thousands of these maggots. Casu marzu is considered by Sardinian aficionados to be unsafe to eat when the maggots in the cheese have died. Because of this, only cheese in which the maggots are still alive is usually eaten, although allowances are made for cheese that has been refrigerated, which can kill the maggots. When the cheese has fermented enough, it is often cut into thin strips and spread on moistened Sardinian flatbread (pane carasau), to be served with a strong red wine. 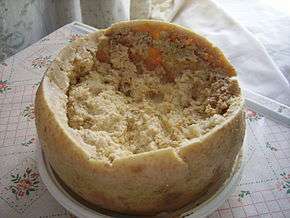 Casu marzu is believed to be an aphrodisiac by Sardinians. Because the larvae in the cheese can launch themselves for distances up to 15 centimetres (6 in) when disturbed, diners hold their hands above the sandwich to prevent the maggots from leaping. Some who eat the cheese prefer not to ingest the maggots. Those who do not wish to do so place the cheese in a sealed paper bag. The maggots, starved for oxygen, writhe and jump in the bag, creating a "pitter-patter" sound. When the sounds subside, the maggots are dead and the cheese can be eaten. Because of European Union food hygiene-health regulations, the cheese was outlawed for a time, and offenders faced heavy fines. However, it remained possible to acquire casu marzu on the black market, where it could sell for double the price of an ordinary block of pecorino cheese. Attempts have been made to circumvent the EU ban by having casu marzu declared a "traditional" food (it has been made in the same manner for more than 25 years, and it is therefore exempt from ordinary food hygiene regulations). The traditional method of making the cheese is explained by an official paper of the local government. A cooperation between sheep farmers and researchers of the University of Sassari developed a hygienic method of production, in 2005, aiming to allow the legal selling of the cheese. However, as of November 2013, casu marzu or casu frazigu is not listed as a recognized traditional food in the Database of Origin and Registration or in the list of the Italian Ministero delle politiche agricole. Therefore, the legal status of casu marzu in the EU remains questionable. There are several other regional varieties of cheese with fly larvae in Europe. For example, goat-milk cheese is left to the open air until Piophila casei larvae are naturally laid in the cheese. Then it is aged in white wine, with grapes and honey, preventing the larvae from emerging, giving the cheese a strong flavour. In addition, other regions in Europe have traditional cheeses that rely on live arthropods for ageing and flavouring, such as the German Milbenkäse and French Mimolette, both of which rely on cheese mites. 1 2 3 Berenbaum, May R (1993). Ninety-Nine More Maggots, Mites, and Munchers. University of Illinois Press. pp. 10–14. ISBN 0-252-06322-8. ↑ "Bizarre Foods with Andrew Zimmern, Sardinia season 6". YouTube. 2011-07-15. Retrieved 2014-08-01. ↑ Stephens, Andrew (30 August 2008). "Top five ... challenging foods; eat, drink, cook ... and be merry". The Age. p. A2. Under "Casu marzu"
1 2 3 4 Overstreet, Robin M (December 2003). "Presidential Address: Flavor Buds and Other Delights". Journal of Parasitology. Halifax, Nova Scotia, Canada: American Society of Parasitologists. 89 (6): 1093–1107. doi:10.1645/GE-236. PMID 14740894. Retrieved 6 October 2008. Under the "Botflies and other insects" section. ↑ Hegarty, Shane (1 April 2006). "Maggots, songbirds and other acquired tastes". The Irish Times. p. 12. ↑ Loomis, Susan Herrmann (May 2002). "Sardinia, Italy". Bon Appétit. Archived from the original on 2006-04-09. Retrieved 8 October 2008. 1 2 Trofimov, Yaroslav (23 October 2000). "As a Cheese Turns, So Turns This Tale Of Many a Maggot --- Crawling With Worms and Illicit, Sardinia's Ripe Pecorinos Fly In the Face of Edible Reason". Wall Street Journal (Eastern Edition). 236 (37): A1. ISSN 0099-9660. 1 2 Frauenfelder, Mark (2005). "Most Rotten Cheese". The World's Worst: A Guide to the Most Disgusting, Hideous, Inept, and Dangerous People, Places, and Things on Earth. Chronicle Books. pp. 22–23. ISBN 978-0-8118-4606-6. ↑ "Casu frazigu - Formaggi" (PDF) (in Italian). Regione autonoma della Sardegna - ERSAT: Ente Regionale di Sviluppo e Assistenza Tecnica. Retrieved 2010-10-29. ↑ "Edizioni Pubblicità Italia". Pubblicitaitalia.com. Retrieved 2014-08-01. ↑ "European Commission > Agriculture and Rural Development > Agriculture and food > DOOR > Denomination Information". Ec.europa.eu. Retrieved 2014-08-01. ↑ "Ministero delle politiche agricole alimentari e forestali. Disciplinari di produzione prodotti DOP e IGP riconosciuti. 1.3 Formaggi". Politicheagricole.it. Retrieved 2014-08-01. ↑ Comuni italiani. "Cacie' punt". www.comuni-italiani.it. Retrieved 30 April 2011. ↑ Prodotti tipici. "Formaggio saltarello" (PDF). www.prodottitipici.com. prodottitipici.com. Retrieved 30 April 2011. ↑ Prodotti tipici. "Pecorino marcetto" (PDF). www.prodottitipici.com. prodottitipici.com. Retrieved 30 April 2011.